Sliding and cantilever slide gates are among the most common types found at commercial, industrial, institutional and residential facilities. 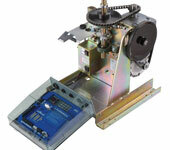 We supply proven Linear automatic gate openers and closers for these installations, all at great low discount prices. From light duty operators for residential applications to maximum duty equipment that can handle the longest, heaviest gates, you’ll find slide gate operators starting under $1,000. We also supply automatic control systems for these products and are ready to help you select time-tested equipment that is an ideal match for your requirements. Find the system you need and call on us for expert advice and great low prices. Swinging gates in industrial grades and ornamental gates for distinctive properties are found throughout the nation. Automatic electric gate operators for these gates must be carefully chosen to match each individual installation. They need to operate smoothly, quietly and safely in all cases. Whether your installation is a single or double swing gate and regardless of length, our money-saving security products company has a top-quality Linear opening and closing system and control options to suit any requirements and specifications. From light-duty residential gate openers starting at around $1,000 to discount-priced operators for the heaviest industrial gates, you’ll find the products you need at prices that fit your budget. Call us to discuss your needs. Access control for parking ramps, parking lots and other vehicle entry and exit needs is typically handled with barrier arm gates. Controlled by operators or automatically controlled with card swipe, entry codes or other control systems, barrier gates and operators are a fast, effective, safe and economical way to manage vehicle traffic. Linear barrier gate systems from our direct-shipping security products company are available for gate arms up to 25 feet in length and even in manually operated, counterweight models. Compatible with a full range of control options, they are reliable, fast, and easy to install. You’ll find a system to suit your precise specifications in our complete product line, and at prices kept low through high volume purchasing discounts and manufacturer-direct shipping to you. Let us supply your needs at money-saving prices. As the most-trusted discount supplier of security and access-control products, our consultants are always standing by to answer questions and assist our customers in choosing exactly the products that match their needs. We often get questions about gate opening and closing systems, and are happy to provide complete information to help in making the right choices. Some of the questions we hear most often are answered on the page at this link, with additional details available with just a click. Get the information you need about these sophisticated gate opening and closing equipment here and then call us to discuss your requirements. Our highest priority is helping you find exactly the products you need at the best low prices. Choosing the right gate opener and closer for your existing swing, slide and barrier gates or for new installations can be complex. The security system consultants at our national, direct-shipping supply company have long experience and expertise in these products and are always happy to assist you in making the right choices. We’re a high volume purchaser of gate operator systems from Linear, the leading manufacturer of this equipment. We pass along our outstanding discounts to our customers and arrange for fast shipping directly from the manufacturer to your location. Call us today with your requirements and let us assist you in product selection.